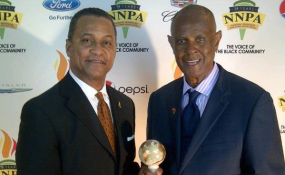 NNPA President Clovis Campbell and CFA President Melvin Foote. Washington, DC — The Constituency for Africa's President Melvin Foote was honored last night by the National Newspaper Publishers Association, for his many decades of work on behalf of Africa. The National Newspaper Publishers Association (NNPA) is a network of more than 200 African-American owned newspapers from across the United States. The award was made last evening at the annual NNPA Awards Reception, held as part of the Congressional Black Caucus Week ceremonies. In addition to the Black Publishers and guests, a number of Members of the Congressional Black Caucus were on hand including Congressman John Lewis (D-GA), Congressman Charles B. Rangel, (D-NY) and Congressman Bobby Scott (D-VA). Copyright © 2014 Constituency for Africa. All rights reserved. Distributed by AllAfrica Global Media (allAfrica.com). To contact the copyright holder directly for corrections — or for permission to republish or make other authorized use of this material, click here.